This simply exquisite 9 carat yellow gold ring features a diamond set into a 4-claw design, making the stone the focal point of the whole ring. Its twisted diamond set shoulders add a modern element to this otherwise classic and timeless piece. 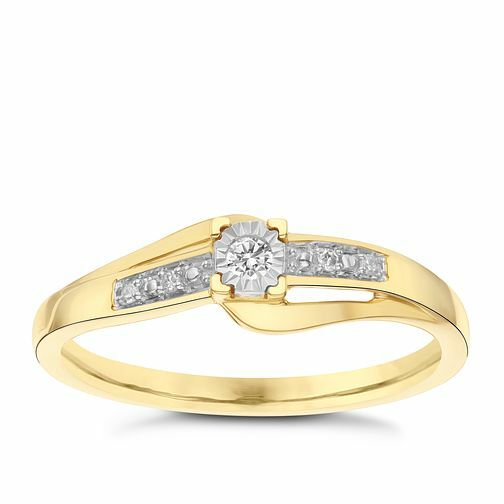 9 Carat Yellow Gold Diamond Set Shoulder Solitaire Ring is rated 4.0 out of 5 by 1. Rated 4 out of 5 by Anonymous from Looks elegant and sophisticated This is a beautifully designed ring, not too overstated yet there is enough detail in the design to make it look expensive and quite “eye catching”. I ordered it to store and collection was prompt and hassle free!